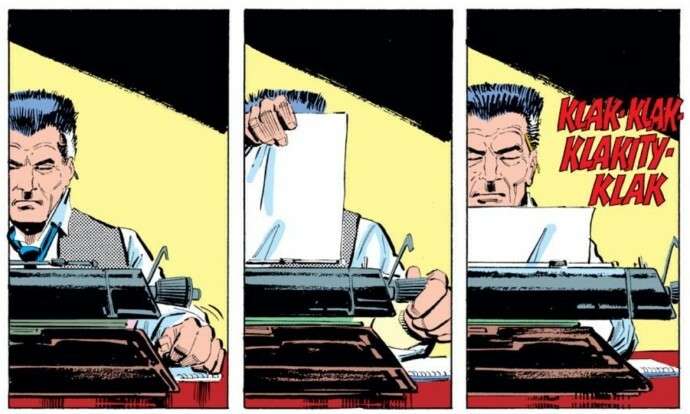 Reading Amazing Spider-Man #250 is like watching the season finale of a television show where the showrunner or writer knows he or she is leaving the show (either willingly or acrimoniously) and thus decides to introduce a ton of big ideas into the final script that are impossible for future creators to effectively resolve. Writer Roger Stern would get a “plot” credit for ASM #251, but there’s no question that ASM #250 is the end of the Stern-era on Amazing Spider-Man. Tom DeFalco and artist Ron Frenz clearly had some new ideas for the Hobgoblin and the general Spider-Man universe after they took the title over. As such, ASM #250 feels like a notebook dump for Stern, especially when it’s read with the power of 20-20 hindsight. Stern packs a ton into this issue, and it plants a number of seeds as to who the writer wanted to reveal as the Hobgoblin (hint: it wasn’t Ned Leeds). But history is history and Stern wouldn’t get to finish his story until more than a decade later. Given the true-life back story regarding the identity of the Hobgoblin, I’ve always found some unintentional humor/irony in what ends up being a critical scene in ASM #250. Spider-Man and Hobgoblin are battling each other (Spider-Man’s Spider Sense is still disabled from a smoke bomb attack in ASM #249) and over the course of the fight, a fire breaks out that ends up destroying Norman Osborn’s journals (which Hobgoblin had been using to blackmail a bunch of New York’s wealthiest and most powerful individuals such as J. Jonah Jameson and Harry Osborn). As the journals are ignited, the Hobgoblin cries out that he’s lost his only copies. With how the character has been built up as such an evil genius by Stern in his previous six appearances this development is a head-scratcher. So this guy was going to attempt to take down all of these power brokers with nary a photocopy to his name? That just doesn’t make sense. Prior to ASM #250, the Hobgoblin exhibited the power of the original Green Goblin (through Norman’s serum) with extreme cunning and intellect. How could he make such a rookie mistake like this? 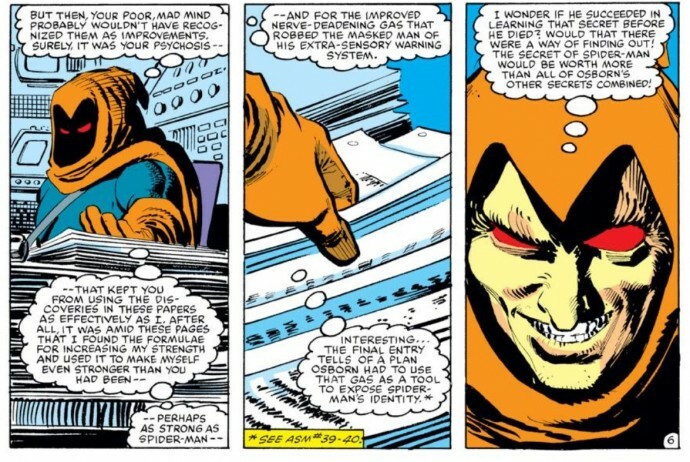 The Hobgoblin’s journal miscalculation feels thematically similar to how a major comic book publisher could introduce a brand new supervillain to serve as the prime antagonist for its most marketable hero, and then be so incredibly indecisive as to WHO is actually portraying this brand new character. Per an afterword found in a trade paperback of 1997’s “Hobgoblin Lives” mini-series, Stern pitched his ideas about the Hobgoblin to DeFalco on his way out the door (or perhaps he was just being coy), and the incoming creative team decided to go in a different direction. The problem for Marvel was the fact that one of the driving forces behind the Hobgoblin’s popularity was that he was shrouded in mystery. In every chapter of the “Original Hobgoblin Saga,” there were clues dropped and misdirection galore about this new masked madman. Stern was making his case, and then future creative teams chose to ignore the evidence (what little they could make out to be evidence) and conjure up new material to suggest somebody else. The end result is that many of the plot points Stern shotguns into ASM #250 come across as being unnecessary and misleading when read in concert with the post-Stern Hobgoblin issues. That is until Stern retcons the story in 1997 and in turn explains the importance of a lot of moments that take place in ASM #250. 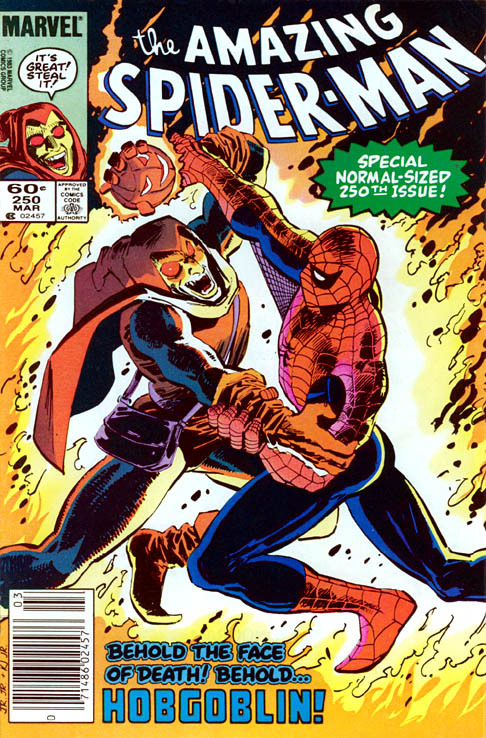 So, if you’re looking for clues about Roderick Kingsley being the Hobgoblin (who Stern reveals as the man under the mask during his retcon), you’re going to find a bunch of them in ASM #250. Throughout the comic, Spider-Man is visiting with all of the socialites who were “invited” to Hobgoblin’s special blackmailing and attempting to shake them down for any information they may have about the villain. Stern lingers a bit with Roderick and that’s when the fact that he has a brother is introduced for the first time (in “Hobgoblin Lives,” we discover that Roderick’s brother Daniel often stood in for him while Roderick was out gallivanting as Hobgoblin). Then, “Roderick” calls the woman he’s with by the wrong name, which is red flag number two that things aren’t exactly what they seem in the Kingsley household. Sure, it could be explained away that a powerful fashion mogul like Roderick spends time with a LOT of women and can’t be bothered with things like names. But why waste comic book space with a scene like this if Kingsley isn’t somehow essential to the storyline? This is unquestionably a “Chekov’s gun” moment. 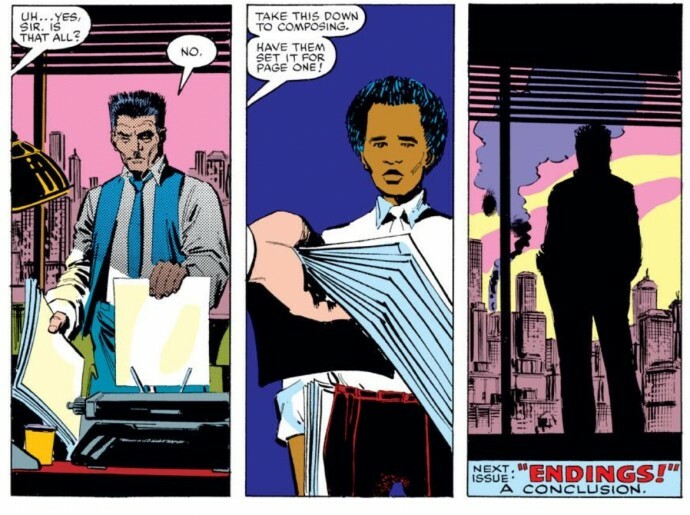 If you look at this scene today armed with information culled from Stern’s 1997 retcon, you can infer that the Kingsley being followed around in ASM #250 is actually Roderick’s brother Daniel, hence the “where’s my brother,” line, his inability to remember the name of the girl his brother was (presumably) shacking up with, and then his skittishness when he’s being shaken down Spider-Man. Keep in mind that in ASM #249, it was “Roderick” who cried out that the Hobgoblin could have been anybody at the club before the villain smashed through the window. Obviously, history would show that the Kingsley in question on that day was Daniel as well. But Daniel never gets brought up again once Stern leaves ASM. Subsequent creative teams honored Stern’s ideas somewhat by showing there was some kind of connection between Roderick and the Hobgoblin, but it would be next to impossible to conclude that he was actually a suspect to be the man under the mask without the reminder that Daniel is a character in this universe as well (who happens to look just like Roderick). Just like that outgoing showrunner, Stern certainly tried to get this plot point moving forward, but alas, it was not meant to be. The final bomb Stern drops on the Spider-Man universe in this issue pertains to J. Jonah Jameson. The long-time antagonist of Spider-Man is being blackmailed by the Hobgoblin for bankrolling the supervillain Scorpion all the way back in Amazing Spider-Man #20. Ever the egomaniac, Jameson decides rather than getting blackmailed, he would confront the accusations head on with a public admission of his role in creating a super-powered murderer (though he fails to own up to all the Spider Slayers and other devices he bankrolled/oversaw to capture Spider-Man). Spider-Man of course calls out Jonah for being a hypocrite – taking justice into his own hand like a vigilante despite railing against Spidey for years for doing the same thing. But in a moment that demonstrates the complicated relationship between the two, Spidey tells Jameson to hold off on the public admission since he intends to apprehend the Hobgoblin immediately. When Jonah scoffs at the suggestion, Spider-Man warns him that such an admission could destroy his career. The closing scene of ASM #250 shows Jonah seeing a warehouse fire in the distance (the fire that was destroying the evidence that would confirm his role with the Scorpion) and he unknowingly hands his article to the copyboy … essentially dooming his career as a journalist. This moment feels a lot like the season 4 finale of “The West Wing,” which was Aaron Sorkin’s last episode as showrunner. The episode ends with the President of the United States resigning and setting up huge complicated plot points that needed to be resolved the following season without Sorkin. I don’t think Stern’s exit from Spider-Man was nearly as contentious as Sorkin’s was from “The West Wing,” but having a major character like Jonah admit to criminal activity and then ending the comic book for DeFalco/Frenz to resolve seems pretty tricky to me. 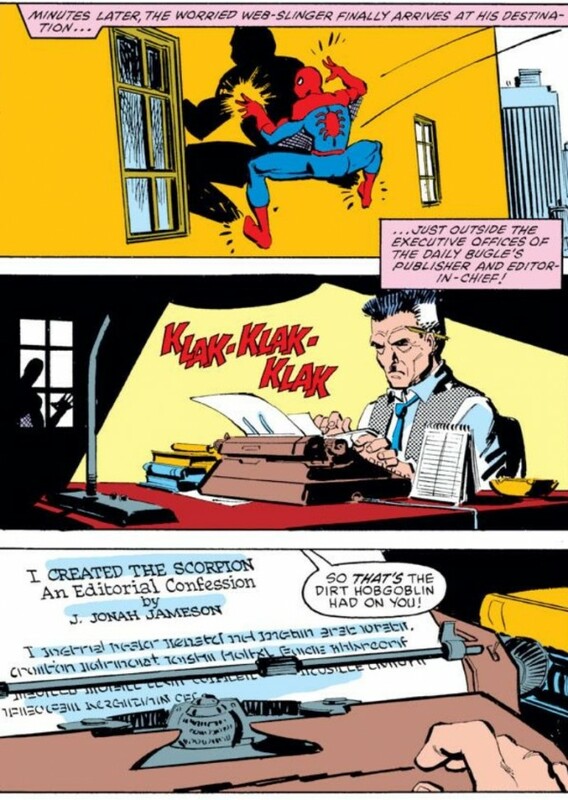 And naturally the resolution to the JJJ situation in ASM #251 was never really satisfactory given his admission. But that discussion is for next week! This is part seven of the Original Hobgoblin Saga. Part eight, the final chapter, will run next Thursday. My favourite all-time run in comics! It’s funny how you’ve (correctly) pointed out all the groundwork Stern did here that was tossed out of the window by DeFalco et al, but when I first read these issues in the early 90s, I assumed the whole Ned Leeds thing was planned from the start. Looking back now I can appreciate the Stern / Romita and DeFalco / Frenz Hobgoblin sagas as two completely different things. The Stern stories are better, of course, and Kingsley makes much more sense as the Hobgoblin, but I still have a soft spot for the Leeds saga that began towards the end of the first alien costume arc. My favorite clue is the subtlest. What’s the first thing Hobgoblin does? He doesn’t improve the weaponry or recreate the formula like most villains would. He redesigns the costume. Because he’s a fashion designer.